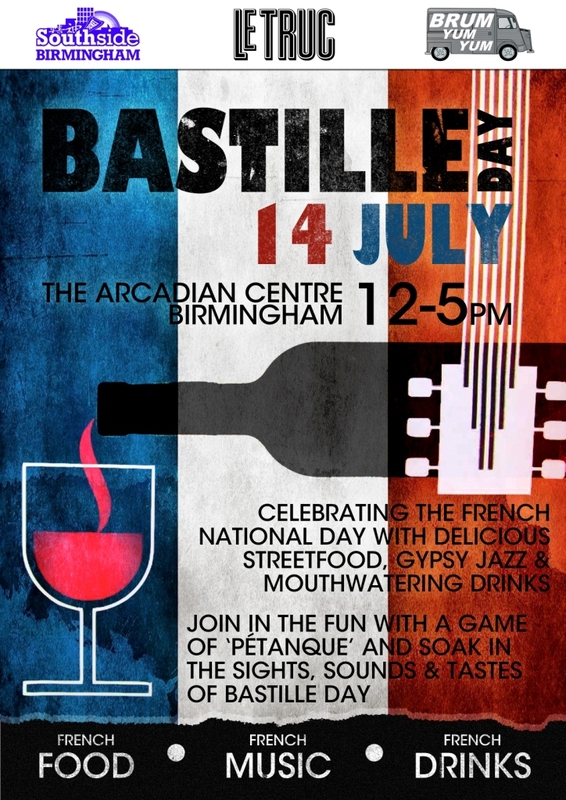 Birmingham city centre's southside district is adding a dash of 'ooh la la' to Bastille Day on Sunday July 14 with its first street food party. Hosted in The Arcadian Centre in Hurst Street, the party is a collaboration with street food producers Brum Yum Yum and will include tasty meals served from five pop-up cafes. Southside's own French restaurant Le Truc will help lead the celebrations, serving steak Rossini baguettes and providing entertainment on its terrace with music from gypsy jazz band Strumpit between noon and 2pm, and a French funk DJ from 2pm onwards. Visitors can also enjoy the sound of French accordions and take part in a game of Pétanque, the French form of bowls, from noon till 5pm. Julia Chance, Southside BID Manager says, "For a long time we have wanted to set up a street food party in Southside as we are the home of some of the most cutting edge and diverse cuisine in Birmingham. With support from Le Truc, we can now show our visitors how innovative street food is and demonstrate that we are at the forefront of the restaurant scene in Birmingham." Duncan Stanley, director of Brum Yum Yum, adds: "Street food took the capital by storm and here in Birmingham, Brum Yum Yum's events are drawing thousands of visitors. 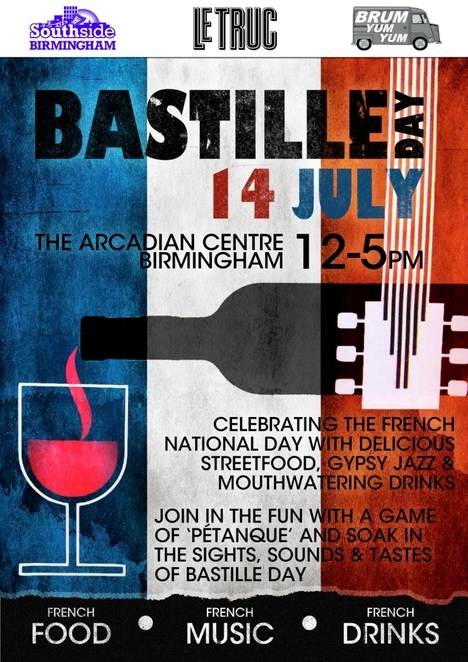 Now we're proud to be bringing the country's hottest food trend to Southside for Bastille Day. Street food is all about real food cooked by real people who care about what you're eating. Ingredients are sourced locally and seasonally from small independent suppliers and freshly prepared right in front of you so you know exactly what's on your plate."